You need to plant Mullein in a sunny site with some shelter from high winds. The soil should be poor, rather chalky and well drained. You should plant in the late spring or early summer, before the heat gets extreme. If the soil is light enough, the plant will self sow and you won’t have to plant any more, ever. When the seeds come up, thin to 1 plant for every 2 feet or add the plants to the ground at spaces of 2 feet. These plants won’t grow indoors so you will have to find a place outdoors; will not grow in containers. If you end up having to grow it in exposed areas with high winds or in areas with rich, moist soil, you will have to stake the plants to support their thin, tender spikes. Moist soils will cause the plants to lean. So always choose the driest, chalkiest soil in the yard available to you. Do not water a lot. In very dry, arid areas with drought conditions, water about once a week. Thoroughly soak the plants. Allow to completely dry out; never leave Mullein in moist or waterlogged soil. It will lean and eventually collapse. Make sure you plant Mullein in an open area with no overhangs or other overhead structures. It will reach 7 feet in height. At various stages of growth, you will harvest parts of the plant for use. Collect the flowers just as they open; do not let them get old on the stem. Collect leaves in their first season, while tender. You can preserve any overages by removing all the green parts from the flowers and dry them gently. Simply tie them to a coat hanger and let them hang in an airy part of the home until dry and crispy. If you leave them untouched they will be perfect. Do not use artificial heat or put in the oven! You must retain the yellow color in the flowers and allow them to dry naturally to retain the coloring matter. As far as the leaves go, any extras can be dried by laying them out in a sunny place and allowing them to dry naturally. Again, do not put in the oven because then they lose their natural juices. You want the plant, both flowers and leaves, to retain as much of their original properties as possible. Decorative Uses: You can use Mullein Flowers in potpourri. They add a mild aroma and lots of color. Dry them for long term use and add them to any potpourri recipe that calls for yellow flowers. They can also be added fresh from the garden to flower arrangements; their tall stems work really well in tall vases. Mullein flowers can also be pressed and added to art or paperboard designs or scrapbooking. Press them by putting them between the pages of a hardcover book and then closing the book. Leave them this way for weeks until fully dry and pressed flat. The tall flower spikes can also be sprayed with or dipped in glycerin to be preserved in their fresh or dried state. This way they can be added to decorations that can then be kept for years. Culinary Uses: Mullien flowers are used to flavor liqueurs or teas. You can buy Mullein tea ready made if you like but it is a lot of fun to pick the flowers from the garden, let them dry out for a day or two and then crumble them up into a tea bag or putting the flowers loosely into a tea ball. Do not include the leaves in the tea. Although they are often used in homeopathic remedies, the leaves can be toxic in larger amounts. So do not add leaves to the tea or liqueur. To flavor liqueur, you can heat a clear, distilled spirit in a double boiler and add sugar to taste. After fully heated, add the flowers and remove from heat. Once the liquid has cooled enough, add to a bottle or other clear container and cork. Put in a window with some sun exposure and leave for a couple of weeks. At this point, you should strain out the flowers and rebottle and cork. It is ready to drink. Uses in the Garden: Plant Mullein in gardens where you want to attract bees. Cosmetic Uses: Use as a facial steam to soften skin and smooth out wrinkles. Add the flowers to boiling hot water in a glass bowl or pan. Drape a towel over your head and sit ove the bowl, allowing the steam to rise to your face. Let is seep into your pores. Afterwards, blot dry. 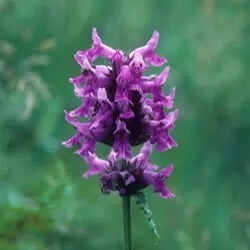 You can also add Mullein flowers to cold creams and other homemade lotions. Make the mullein water by adding handfuls of fresh Mullein flowers to a pot full of water. Simmer over medium heat until the water darkens and loses some volume. Add more water and more flowers. Simmer for another half hour or so until the water is darker and the volume has reduced. Strain the flowers out of the water and set the dark water aside, allowing it to cool. Melt the beeswax, emulsifying wax and lanolin in a double boiler. Warm the oils with the glycerin in another pot and then slowly add the melted waxes. Beat the waxes into the oil until creamy. Remove from the heat. Warm up the mullein water and dissolve the borax in it. Dribble the mullein water/borax mixture into the cream, beating it the entire time. Keep stirring until the mixture cools and thickens. As it cools down, add in the oil of neroli. Spoon into jars and label. This stuff with make your skin really soft. Medicinal Uses: Steep the flowers in hot water until the water turns yellow. Strain out the flowers and then drink the water like tea to relieve persistant coughs, reduce mucus and soothe away hoarseness. Long heralded as a great cough tonic, Mullein can be added to just about any tea for relief. For that persistant dry cough you just can’t shake, try a tea made of 1/3 dried Coltsfoot , 1/3 dried Horehound and 1/3 fresh Mullein flowers. Drink as needed. Another use of Mullien flowers is to make a tincture and use it as an eardrop to help soothe earaches. To make a tincture, put 4 oz of the powdered herb or 8 oz of fresh chopped flowers in a container with a very tight lip or cap. Add 2 1/2 cups of 60-proof alcohol like Vodka or Brandy. Put this in a sunny place and shake it twice every day for 2 weeks. Strain through double mueslin, squeezing out every drop of liquid, and store it in a vial with a stopper. Use an ear or eye dropper to administer. Everyday Uses: One of the oldest use for Mullein leaves has been as a repair for worn soles. Simply lay a leaf down inside worn out shoes and it not only soothes your feet but it strengthens the shoe! These are known to be better inserts than the ones you buy in the store! They will literally last forever, never get stinky and make your feet cooler if you leave them in the shoe day and night. The leaves are also great preservatives and are often used to keep foods from going bad. Fresh vegetables benefit the most from being wrapped in Mullein leaves. And one of the age old uses of Mullein leaves is the down. The thick furry stuff on the leaves, the reason they are called the Velvet Plant, are also a great tinder. They will start just about any fire, no matter where you are. It is considered a first-rate drill for use in the hand drill method of friction fire lighting. So bring some Mullein along when you go camping. Medicinal Uses:You can use Mullein leaves in tiny amounts in homeopathic remedies. They are most effective in treating earaches and migraine headaches. The leaves can also be infused as a tea for coughs and mucus. Heat the leaves in water until the water changes color and reduces in volume. Strain carefully through cheesecloth or fine muselin to remove all of the fine hairs on the leaves before drinking. This is a very effective tea for dry, irritating coughs. Always drink very small amounts at intervals during the day. It is very effective but in larger doses it can be toxic; so drink small doses. I say about a half cup every few hours should do it. 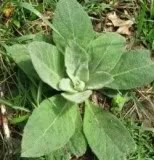 Dried Mullein leaves make a great substitute for tobacco. Add dried Coltsfoot for a real smoking experience! Crumble up the dried Mullein and Coltsfoot and roll up like tobacco and smoke.